Day 2 (Monday, July 16th): We started out in Kingman, AZ. Our first stop was at the local Von’s to get ice and a few more drinks. This was to become a daily ritual on the trip – refill the cooler with ice in the morning. On days where we had our heads together we would get ice from that night’s motel, but sometimes we woke up too foggy to remember to get the free ice. Day 2 was one of those days. Course #5 - Firefighter’s Memorial Park, Kingman, AZ - After Von’s we drove just a few blocks over to Firefighter’s Memorial Park and ate our breakfast in the shade. At 8:30am it was already starting to heat up. We met Jim, a park employee who welcomed us to Kingman and cha tted with us about our trip and parks in general. Along with the 9-hole disc golf course, Firefighter’s Park had a pretty cool looking skateboard park, all constructed from concrete. Jim talked a bit about the skate park, lamenting the fact that there were a few n’er-do-wells who regularly vandalized the skate park. They also liked to vandalize the golf course, as we found that several of the holes were missing tee signs. One really cool thing about Jim was his awesome handlebar mustache and goatee – not what you would expect to see on the park maintenance guy – but I’m guessing he’s not your average park maintenance guy. Firefighter’s is a nice 9-holer with small gaps and low ceilings through bushy pine trees that add to the challenge. There was also a homeless guy on one of the fairways that caused us to modify our tee shots – I really wanted to throw a roller on that hole, but didn’t want to disturb him. AJ almost lost his black Z Comet in one of the pine trees, but he got lucky and hit it with a pine cone. We finished up our morning round and got back in the Pilot to head off to Flagstaff. Jim told us that we could take Route 66 for about an hour on our way to Flagstaff so we decided to take his advice. Finding Route 66 was a bit of an adventure – we spent a few minutes wandering through some neighborhood back streets before we found it. One thing you have to remember is that the road usually isn’t marked as “Route 66,” since that is a now-defunct highway designation. Route 66 took us through a bunch of tiny towns with cool-looking mini-downtowns. We stopped in Seligman, which was right next to I-40, to get some lunch and gas (not necessarily at the same time…). The stop was definitely worth it, as we found a cool little general store that had a sandwich counter. We decided to try the buffalo burgers, since we were on an adventure and we were not disappointed. We also split a pineapple shake, which was a bit frustrating, as the pineapple bits kept clogging up the straw. Should have expected that. We jumped back on I-40 to make our way to Flagstaff. Flagstaff was going to be our next EDGE-related stop. Our mission in Flagstaff was to teach some kids at a city-run day camp about disc golf. Lucky for us, the day camp was right next to McPherson Park, their newest 18-hole disc golf course. Our plan was to describe the game, explain the basic rules, and then show the kids the basics on grip and throwing form. After the clinic we planned to take them out to play a few holes at McPherson Park. We arrived about an hour before our appointment and met with the director of the camp, Crystal Warden. We talked through our schedule wit h Crystal and then decided to walk over to the golf course to select a few holes that we could play with the kids. Everything was going smooth – we found a layout of four holes that were close to the camp and were well-designed for beginners and we were finishing playing the last hole with about 15 minutes left before the clinic. Then came the lightning!!! 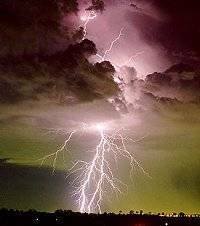 It struck about five times in one minute and only about 1,000 feet away (you know, you see the flash then count one Mississippi – BLAM!!!). We ducked our heads and sprinted back to the day camp building, staying far away from the DGA lightning rods. We made it back to the building just as the rain started – and it came in buckets. We waited for about 30 minutes to see if the storm might pass, but it was not to be. The rain pretty much trashed our plan for the clinic. But not all was lost. We spent some time inside the camp building talking to the kids about disc golf, and passed out EDGE discs to each of the kids on hand. We also gave an EDGE DVD and some brochures to Crystal, so she and her staff could learn more about disc golf and incorporate use of the McPherson Park course into their regular activities. All was not lost. We decided to wait out the rain and lightning in Flagstaff, since we hoped to play some of the courses in town. To kill some time we decided to go to the city library to use a computer to post the news of our travels. We had to sign in as guests to get computer access – 30 minutes on what seemed to be the slowest Internet connection in the Western Hemisphere (but better than none). Once we were done, the rain had let up and the lightning gods had moved on to torture another city. Course #6 - Northern Arizona Univrsity, Flagstaff, AZ - Our next stop was Northern Arizona University Disc Golf Course. This course was top notch. We had played at NAU before, three years prior, but this was not the same course! Construction on campus had forced the course that had been used for Amateur Worlds in 2005 to be removed. Luckily, the campus decided to replace the course on another piece of campus property. The new location was actually easier to find and had better access to parking – two good things. The new layout was very similar in design to the old – lots of tight gaps through tons of pine trees, with some moderate elevation change. The rocky terrain led to some weird bounces here and there, so recovery shots were important. A few holes let you really rip one. One hole in particular, hole 13, was 485 feet, downhill along a power line easement, and perfect for a huge S-curve. AJ crushed one all the way down the valley and it landed about 30 feet from the basket. Great finishing hole too. Much like hole 13, hole 18 was downhill and about 450. This round, AJ only lost by one stroke. Course #7 - Thorpe Park, Flagstaff, AZ - After finishing up at NAU we headed over to Thorpe Park, which we had played three years previous, in 2004. Thorpe Park was also used for the Am Worlds in Flagstaff in 2005. This course also plays through a forest, but it’s a lot more wooded and seems to have older growth (or at least bigger) trees. The added trees caused many drives to end up short, after whacking one of the big trees. One highlight was how close the score was. Going into the 18th hole, the score was tied. A.J. prevailed and got a birdie on the par 4 letting him finish out on top for this round and take the bag tags. We finished around 7pm and still had some sunlight left. We decided to go back to McPherson Park to see how much of the course we could play before dark. Course #8 - McPherson Park, Flagstaff, AZ - We knew that we wouldn’t be able to finish a round of golf with the sunlight we had, so we decided to use some of our glow-in-the-dark discs and our discs that light up. We brought along a flashlight to charge up the glow discs, and this helped a little. The better option turned out to be the light-up discs. I had received a few sample Quest drivers from BlackJax Sports - light-up discs from the manufacturers when I played at the 2007 memorial tournament in Phoenix. Two guys from the company showed up at the player’s party and were handing out sample discs. They look very similar to a Valkyrie, except that they have a small circular pod on the underside to hold the battery and electronics, and then three led lights out on the rim of the discs. They flew very high-speed under-stable and low speed over-stable, which took a little getting used to. It was fun to watch the Quests fly through the air lit up, and even cooler when they rolled. We played most of the course, but eventually had to give up, not because we couldn’t see our discs, but because we couldn’t find the baskets in the pitch-black conditions (no moon). It was fun, but, we would’ve been able to enjoy the course more if it was light out. 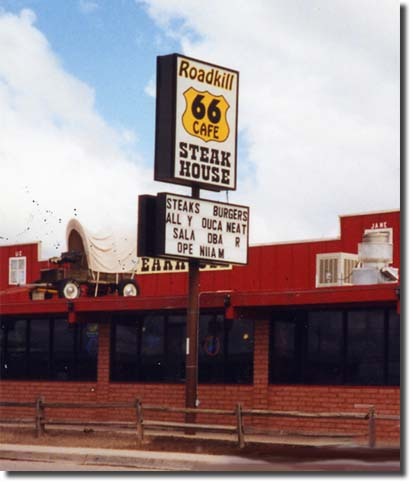 We prepared our delicious dinner of tuna salad and hit the road for Gallup, New Mexico. We didn’t make it to Gallup until after 1am, ending Day 2 (very late at night). We were impressed by the quality of the disc golf courses in Flagstaff. Not only were they good designs, fun and challenging to play, they were also well signed and maintained. One of the biggest complaints we have had as we travel to play new courses is that many courses are nearly impossible for non-locals or new players to play. Signage is extremely important for players who have never played the game or that particular course. I assume that most players would like to see more people play the game of disc golf – it’s more fun when others play with you and more players often leads to more courses. But how will new players find the game if there is no sign at the park announcing the presence of the course or no rules sign to explain how the game is played? And if you are able to find the course it’s extremely frustrating to be able to see the baskets, but have no tee signs or pads visible to direct your play. Even the most simple signs, numbered posts or monuments are better than nothing at all. Flagstaff provided one of the best examples we had seen of a community where all of the courses were well documented and the courses were relatively easy to follow (except of course for the odd blind tee shot). I’ll go back to play in Flagstaff any day!